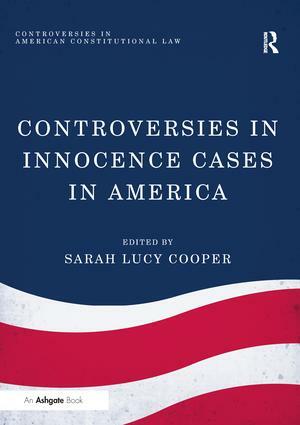 Controversies in Innocence Cases in America brings together leading experts on the investigation, litigation, and scholarly analysis of innocence cases in America, from legal, political and ethical perspectives. The contributors, many of whom work on these cases daily, investigate contemporary issues presented by innocence cases and the exoneration movement as a whole. These issues include the challenges faced by the movement, causes of wrongful convictions, problems associated with investigating, proving, and defining 'innocence', and theories of reform. Each issue is placed within a multi-disciplinary perspective to provide cogent observations and recommendations for the effective handling of these cases, and for what changes should be adopted in order to improve the American criminal justice system when it is faced with its most harrowing sight: an innocent defendant. Sarah Lucy Cooper is a Senior Lecturer in Law and founding member of the Centre for American Legal Studies at Birmingham City University in the UK where her teaching and research focus on English and American criminal procedure, practice and reform. She is a barrister and Lord Denning Scholar of the Bar of England and Wales, and a pro bono academic for Amicus. Sarah is a Fellow at the Arizona Justice Project - a non-profit organisation that considers claims of ’innocence’ and ’manifest injustice’ from Arizona inmates. In 2012, her work on Bill Macumber’s case was documented by Barry Siegel in his book, Manifest Injustice: The True Story of a Convicted Murderer and the Lawyers who Fought for his Freedom. Sarah has published and presented her scholarship in Europe and the USA, and was recently shortlisted for Birmingham Law Society’s 2012 Pro Bono Lawyer of the Year award and a 2013 Extra Mile Award. Controversies in American Constitutional Law presents and engages with the contemporary developments and policies which mould and challenge U.S. constitutional law and practice. It deals with the full spectrum of constitutional issues, publishing work by scholars from a range of disciplines who tackle current legal issues by reference to their underlying legal and political histories and the philosophical perspectives that they represent. Its cross-disciplinary approach encourages analysis of past, present and future challenges to the idea of U.S. constitutionalism and the power structures upon which it rests. The series provides a forum for scholars to challenge the boundaries of U.S. constitutional law and engages with the continual process of constitutional refinement for the protection of individual rights and liberties, within an evolving framework of legitimate government. CALS promotes research, scholarship, and educative programs in all areas of U.S. law, and is the home of the British Journal of American Legal Studies. Faculty members have extensive experience in submitting amicus curiae briefs to the United States Supreme Court and lower federal courts, and advising on criminal justice issues in many states. CALS coordinates the largest British law undergraduate internship program to the United States. Through this program, and members' research, CALS has created relationships with over one hundred partners in over twenty-five states. CALS faculty advise public bodies and provides professional training and speakers at conferences across the USA.